I refer regularly to Jim Harrison’s collection of food essays the Raw & the Cooked because even though they were written more than ten years ago their relevance to contemporary culinary trends persists. In one such essay, Harrison writes about the tens of millions of chicken legs and thighs the US ships to Russia annually because the domestic market has a preference for the breast. Mocking America’s stupidity and wastefulness, he imagines the ship sinking and the surprise of a frenzy of sharks as they bite down on tons of frozen dark meat. When in this month’s issue of Bon Appetit I noticed a side-by-side of features on Fergus Henderson and Gwyneth Paltrow, I recalled Harrison’s essay. Credited for his emphasis on Nose to Tail eating, the BA article features Henderson discussing the traditional British Sunday roast — something that he neither resurrected nor uses offal nor is seasonal for the June issue — and the feature on Paltrow showcases her new family cookbook My Father’s Daughter and the way it places her at the heart of domestic cookery. Henderson, an architect by training turned restaurateur, is a man whose reputation hinges on having turned his back on our inherently wasteful carnivorous habits, and who, in so doing, inspired a generation of chefs and home cooks to do the same. Paltrow, an actress, celebrity macrobiotic vegetarian and hispano-file turned TV karaoke sensation, is using her fame to encourage families to eat healthily together. Both are laudable goals, with broadly similar underlying philosophies of reduced carbon footprints and personal happiness. However, one is an established giant in the gastronomic world whose cookbooks have been cult classics for years, the other is a bona fide A-list celebrity and first-time cookbook author. Which of them do you think Bon Appetit featured on the cover? As it happens, in many ways I rather like the new direction BA editor Adam Rapoport is taking the magazine. For me, turning it into a journal that appeals to both ends of the home cook and food enthusiast spectrum – and reclaiming some of the now absent Gourmet magazine’s territory – something these two contrasting features amply demonstrates, is both admirable and sensible. The improved graphics and slightly quirkier editorial line are also significant improvements over Barbara Fairchild’s rather constipated copy and frumpy presentation, but I must descry the bandwaggoning of Gwyneth. People whose entire career’s have been spent innovating and producing excellence behind the burners have never made BA’s cover, and simply because she’s currently flavor of the month after karaoke-ing her way into the spotlight again, to make her the cover story almost at her first foray into the food world seems both perverse and wrong, particularly since she’s not even the first good-looking female celebrity to write a cookbook. Indeed, the article featuring Ms. Paltrow is little more than two paragraphs long which wouldn’t normally constitute lead article status, even in a publication as light on reading material as BA typically is, so the use of her celebrity to make it cover material is barely disguised. What’s more – and I’m no prude – the photo spread accompanying the article competes with Rachel Ray’s FHM spread in the tasteless stakes for objectifying her as eye candy – perhaps unsurprising for an editor whose own reputation was built at GQ, but the article is at pains to promote Paltrow’s recipes, describing them as being of the same ilk as those of Jamie Oliver and the River Cafe cookbook, the popularity of which suggests some kind of cynicism on behalf of the publisher. 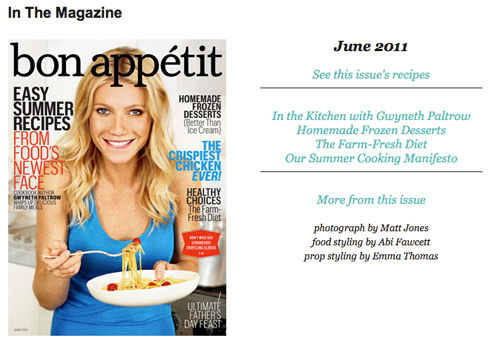 Now, you might argue that the way Paltrow cooks bears a much closer resemblance to the way we cook at home than the magical concoctions of Ferran Adria, and while that might very well be true, if I wanted a celebrity to show me how to cook spaghetti with cherry tomatoes I’d buy a copy of People magazine and expect to find her recipes there. Nonetheless, I have no personal beef with Gwyneth. I am entirely prepared to concede that she is very likely a great human being: a loving and devoted mother, an abundantly talented actress and singer, and a polymath, able to turn her hand successfully to almost any venture. However, I still maintain that the arrival of her first cookbook should not justify an appearance on the cover of one of the world’s pre-eminent culinary journals, if for no other reason than it somehow cheapens that publishing real estate for subsequent issues and mocks those whose careers should justify such an esteemed location. On another level, while BA’s final page feature of some celebrity and their food faves has been underway for a while and is mostly tolerable, to devote the cover to a mainstream celebrity when such folk already have an entire press industry devoted to them and their glamorous lives already is very disappointing. Surely the role of the food press is to highlight those really making a difference in the food world not to cravenly devote column inches to Hollywood celebrities parachuting in when they feel like promoting their credentials as lifestyle models? Comments welcome. I had written BA off years ago since it seemed to celebrate crass living and over-the-top consumerism with schlocky recipes. I don’t know if that has changed. If the new editor is putting a real article about Fergus in the mag, I am willing to give a look. If he had to put Gwen on the cover to get it… well, not the worst thing that could happen. DO you like the new version? I enjoy your views, they are well written and … the world is wider than a recipe column. @Deana: I’m not sure I’ll ever “like” BA that much. It still has its fair share of schlocky recipes with the word ‘easy’ banded about, plus we’re only subscribers because we got a year free after Gourmet collapsed. When it comes time for renewal I think we’ll move on to Food & Wine or whatever. That they’re including Fergus Henderson is a good sign, but they didn’t include him doing his food, rather a pretty generic roast beef lunch. The world is indeed wider than a recipe column. Amen. Amen. And I’ll say it again — Amen. BA is never my first choice for cooking magazines, but I’m looking ahead with some interest as they move forward. Paltry Gwyneth aside. We’re in the same Gourmet spillover group ourselves. I recycled the renewal slips. There are many, many reasons why Paltrow’s appearance on the cover of BA is offensive, and you nailed most of them. My main beef (heh) is that she does not even come close to exemplifying a person that is a lover of food. She’s just yet another fad dieter whose strict dietary restrictions thinly mask an eating disorder. Publicly promoting fasting and the Master Cleanse detox as viable ways to drop weight is less thin a veil. I haven’t read Paltrow’s thoughts on fasting, but think it’s a bit hyperbolic to say she “doesn’t come close to exemplifying a person that is a lover of food”. In the PBS TV series she did with Bittman & Batali, she certainly seems to enjoy the gustatory delights Spain has to offer. And what on earth would move you to write a cookbook if you weren’t enthusiastic about food? It’s not like she needs the money. As far as putting her on the cover, sure, there are tons of people more “deserving”, but print publications need all the help they can get, and *news flash* celebrities, especially recognizable, attractive ones, sell! It’s the same complaint Vogue readers express regularly, that the magazine constantly puts actresses on the covers instead of “real models”. But that’s what sells at the newsstand. Bottom line, I totally get why it’s annoying, but I guess I view it as a fact of life that print media has to utilize celebs to maintain their sales, so I’m not surprised or fazed by it. I too was hoping that with a new editor BA might become something I actually looked forward to each month. When Gwyneth came out of the mailbox I was skeptical. After reading the issue I was depressed. I hope they will make it into something worthwhile reading, they’ve got till my subscription runs out to do so. I watched her in several episodes of the PBS show with Mario and Mark (and some Spanish chick) and found her rather annoying. There were segments where she wouldn’t eat what was being prepared, so what’s the point? And I just can’t take anyone who would name their kid “Apple” very seriously. Read my post in a few days about one of “Gwynnie’s” recipes from Food & Wine April. She is nauseating. Let’s go for someone real, like Sandra Lee for the BA cover, no? Unfortunately it really is about who will sell issues and get ratings, so these media companies generally default to the lowest common denominator in order to get the job done (see also: Food Network). It’s depressing, but at the same time that void has really inspired some thoughtful blogs to pop up (this one included). I really want that book now–as a fervent eschewer of chicken breasts outside of eating them from a whole roasted chicken, that essay sounds hilarious. ps i miss Gourmet immensely- i cannot abide BA. I’m glad I was not the only one left disappointed with the cover and the new edition of BA. Yes, they need to sell the magazine and so decided on a self proclaimed foodie vegan (oxymoron?) to do so. I’m left flat with each new issue since the relaunch. I think Saveur or Fine Cooking has more substance these days.